Strikes. Strikes by Auto Rickshaw drivers. Strikes by Bus Transport employees. Strikes. An old Blackmail method used by the Communists and Socialists [the Left] that unfortunately works even today. Competition from the Private Sector or others. Demand for Hike in Wages. Frequently seen in cities like Mumbai, Bangalore and Delhi, both, employees of state run transcos, as well as auto/taxi drivers have often protested against others disturbing their Monopoly. Recently, autos and taxis in Delhi went on a strike demanding that the government shut down app based aggregators such as Ola and Uber. The irony of the situation is that such strikes force the public to turn to the aggregators, totally defeating the purpose of the strike. In cities like Mumbai and Pune, an auto or cab strike might affect businesses because both run by the meter. However, the use of non Kaali-Peeli cabs and auots is quite high in the city. In Delhi, Bangalore, Chennai, these strikes would be problematic, because the autos in the city rarely go by meter. In the long run, an Uber or Ola would cost lesser than an auto anywhere in Delhi. The other reason for a strike, a more legitimate one, is the demand for a hike in wages. Recently, employees of BMTC, KSRTC, NW/NE-KRTC in Karnataka went on a 3-day strike demanding a 35% hike in wages. Though the strike lasted only three days, it was declared as indefinite, and would have gone on had the Government of Karnataka not convinced the striking staff to accept a 10.5% hike. This strike made life miserable for people in Bangalore. Autos began fleecing commuters, something that they are experts at. To compound the issue, the Karnataka Government’s draconian 1950-era rules for Cabs and Aggregators just made life miserable. With some universities choosing to remain open, life looked very dystopian. In Ocober 2015, BEST employees threatened to strike because the higher-ups held back their Diwali bonus. Common sense prevailed and the strike was called off. This kind of strike is a bit legitimate, since employees do deserve an occasional pay hike. Now, what can be done? What can be done about a strike? A Strike or Bandh can cripple a city, or in this case, a state. It kills productivity, and destroys the economy. Of course, there are some people who claim that Strikes and Bandhs are Good for the Environment. Here are some methods to help limit strikes and their impacts on the society and its economy. A decentralised transport system limits the impact of a strike. A strike by BEST employees won’t affect transport in Nagpur. However a strike by BMTC will affect Mysore since BMTC is essentially a subsidiary of KSRTC. Salaries must be on par with inflation and the private sector. Bus drivers and conductors aren’t the ones with the easiest job in the world. Pay them what they’re worth. Take strict action against those striking. Just because employees belong to a government body, that doesn’t let them strike as and when they feel like. Author SrikanthPosted on 05/08/2016 23/02/2017 Categories BEST, BMTC, KSRTC, TaxiTags Auto, BEST, BMTC, KSRTC, Taxi2 Comments on Strike it Off! Some bus depots are lucky. They house various kinds of buses, old, new, fancy, premium, luxury, you name it. In this post, I’m going to talk about luxury buses [Branded as such] of two specific depots: The Parel Depot which comes under the Mumbai division of MSRTC and Depot No. 4 of KSRTC’s Bangalore division. And no, Depot #4 here is not the same depot where Bus no 8954 was stationed. Featuring the standard bus that almost all STUs in India have, the Volvo B7R, MSRTC successfully runs these buses on the Dadar-Pune, Thane-Swargate, Pune-Nashik, Mumbai-Aurangabad and Pune-Aurangabad routes, mostly as a non-stop service without a conductor. Branded as the Shivneri- a 17th century fort located in Junnar, Pune, where Chhatrapati Shivaji was born, it briefly made an appearance on the Kandivali-BKC route as the Shivneri Corporate. They were given a minor overhaul in 2015 with LED displays displaying the route up front. MSRTC’s Shivneri Volvo. Image copyright Srikanth Ramakrishnan, CC-BY-SA 4.0 International, available on the Wikimedia Commons. In 2015 MSRTC started running trials of Scania’s Metrolink series. At that point, KSRTC had already completed trials of the twin-rear-axled Scania MetroLink and was in talks to procure them. MSRTC finally inducted several single-rear-axled buses into its fleet under the Shivneri brand. They are mostly seen on the Dadar East to Pune Station route. MSRTC’s Shivneri Scania. Image copyright Srikanth Ramakrishnan, CC-BY-SA 4.0 International, available on the Wikimedia Commons. Now, when an STU has a Volvo B7R, natural progression is when it acquires a Volvo B9R. And thus, MSRTC brought out the Ashwamedh, named after the Ashvamedha horse sacrifice ritual of the Vedic times. If, it was indeed an Ashwamedh sacrifice, MSRTC would probably conquering territories under Ashwamedh routes from competition, be it private or another STU. 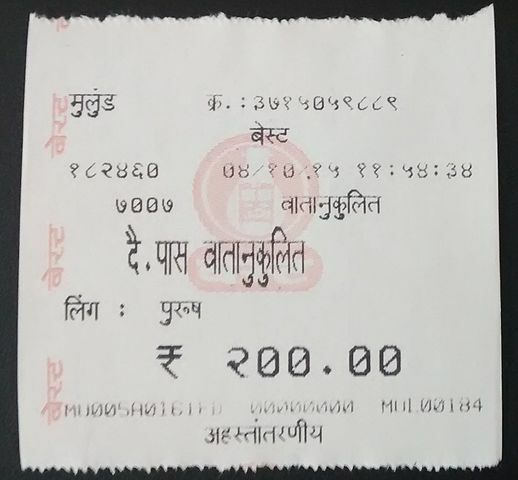 The Ashwamedh has the same fare structure as the Shivneri and is offically still called Shivneri on the ticketing system. MSRTC’s Ashwamedh Volvo. Image copyright Srikanth Ramakrishnan, CC-BY-SA 4.0 International, available on the Wikimedia Commons. Evidently someone at the MSRTC design department was a fan of Francis Ford Coppola’s The Godfather and decided to stick a picture of a Horse’s Head on the side of the bus. This person was also a Nationalist and put the Tiranga on the side, thus making this an ideal bus on the Delhi-Lahore route, to capture and recapture territory. Now, as competition to the most outrageous livery, MSRTC decided it go a step further. It had a single rear axle Scania, might as well go for a twin rear axle one as well right? And thus, the Scania Ashwamedh was born. MSRTC’s Ashwamedh Scania. Image copyright Srikanth Ramakrishnan, CC-BY-SA 4.0 International, available on the Wikimedia Commons. This was not only competition to the previous Ashwamedh, but also, to KSRTC’s buses. The Scania Ashwamedh was originally meant for the Mumbai Central – Swargate – Hyderabad route, but was ultimately extended to the Dadar-Pune Station and Dadar – Swargate routes. KSRTC has been the pioneer of intercity Volvo buses for a long time. It operates long distance routes from Mangalore, Mysore and Bangalore to Chennai, Trivandrum, Shirdi, Hyderabad, Mumbai, and Pune. The original Airavat, as KSRTC named their Volvo B7Rs, retains the same livery even today. Here is a picture of the Airvat, clicked in 2007. KSRTC’s Airavat Volvo. Image copyright Girish, CC-BY-2.0 SA Generic, available on the Wikimedia Commons. The Airavat refers to the Airavata, the mythical white elephant that carries the Hindu god Indra. The bus itself is white in colour, and well, one could very well argue that it looks like an elephant. Natural progression resulted in KSRTC getting the Volvo B9R, named the Airavat Club Class, this was possibly what made MSRTC get the livery on their Ashwamedh Scanias. KSRTC’s Airavat Club Class Volvo. Image copyright Srikanth Ramakrishnan, CC-BY-SA 4.0 International, available on the Wikimedia Commons. This was followed by the Airavat Bliss and the Airavat Superia. Both featured an in-house pantry, with the Superia featured a Chemical Toilet. Pictures of these two will make it here later. KSRTC has two low resolution pictures on its website. Now, being the pioneer in luxury services, you can’t expect KSRTC to be behind the rest can you? No, thus, KSRTC became the first transco to get Scania MetroLink buses with a twin rear axle. KSRTC’s Airavat Diamond Class Scania. Image copyright Srikanth Ramakrishnan, CC-BY-SA 4.0 International, available on the Wikimedia Commons. Nicknamed as the Airavat Diamond Class, it is currently KSRTC’s most premium service. Ticket prices are more or less on par with the Airavat Club Class. The tagline on the side of both the Club Class and the Diamond Class says Sleep Like a Baby, and has a picture of a baby on a pram. Of course, it also features a teddy bear and a rubber ducky, so one is left scratching their heads wondering if it has a bath tub on the inside. All said and done, I am a supporter of Capitalism and believe in Privatisation of certain services and Private Participation in essential services. However, I for one am not too enthused with Premium buses owned by Private Transport Companies for one simple reason: Bad maintenance. Private Transcos never maintain their buses well. One can observe Neeta Travels with either the Engine compartment open or missing its cover. Very few exceptions exist, such as Conti Travels or ABTX Travels, both based out of Coimbatore. Note: Shivneri Bus without AC =Hirkani. Airavat Bus without AC =Rajhamsa. The Jawaharlal Nehru National Urban Renewal Mission [JnNURM] is probably one of the most well known Government schemes that happened from 2005 to 2014. Anyone living in a big city would know what JnNURM is purely because of the ugly JnNURM logo being plastered everywhere, from buses to flyovers and ultimately to ultrasonic flow-meters used to measure water flow in underground supply systems. Logo of the Jawaharlal Nehru National Urban Renewal Mission [JnNURM]. Image in Public Domain. Now flyovers, bridges, skywalks, underpasses, et al, are out of the purview of this article. The discussion is about buses. In 2013, it was announced that the Central government was willing to fund the allotment of an additional 10,000 buses and development of ancillary infrastructure such as Depots, Workshops and Control Rooms. In a letter addressed to the Chief Secretaries, Principal Secretaries of all States and UTs, Municipal Commissioners and Heads of State Transport Undertakings, the Ministry of Urban Development, Government of India, laid down some important guidelines. Among the various points mentioned in the above document; Point 3 talks about Definitions. It defines State as a State or Union Territory, a city as a City, Agglomeration, or Metropolitan area defined by the State, and Special Purpose Vehicle [SPV] as meant to run bus services within a city. It also states that existing corporations such as BEST, DTC, BMTC et al, also come under the definition of an SPV. A crucial thing to note here is Point 3.4 which talks about Para-Statals like KSRTC and APSRTC, which can operate buses under JnNURM, but would require an SPV at city level, OR could set up an SPV for a cluster of cities under Point 3.5. Now, not all transcos followed the JnNURM guidelines. State level transcos as well as their city level counterparts did what was ideally not permitted. Now let us list out all the violations that were possible; and then examine them case-by-case. This article only deals with the operating body, and jurisdictions. Another article will come soon on violations of bus specifications. Not setting up an SPV to handle JnNURM buses. Using JnNURM buses outside the city or area where they were to be used. Using JnNURM buses for purposes other than Public-Transport. Now that the violations have been listed, let us examine, on a case by case basis, what each transco did. An MTC Volvo on Route 588B from Broadway to Mamallapuram. Image copyright Vinoth Thambidurai, CC-BY-SA 3.0 Unported, available on the Wikimedia Commons. One of the earliest pioneers in the JnNURM violations, the MTC recieved a set of Volvo B7RLEs which it operated inside city limits, on routes such as CMBT-Red Hills or CMBT-Chengalpattu. It also ran on routes such as 588B from Broadway to Mamallapuram, which is acceptable as it is a city route. The issue cropped up when MTC transferred some of its Volvo buses to TNSTC Villupuram, and began using them on various intercity routes such as Chennai-Puducherry, Chennai-Hosur, and Chennai-Trichy. Perhaps its MTC which is innocent and TNSTC which is the culprit. TNSTC Coimbatore and TNSTC Madurai received non-AC Semi-Low-floor [SLF] buses for intra-city use. These buses were not used on routes outside of their respective cities but there was no SPV created for them. Of course, one may argue that TNSTC Coimbatore’s JnNURM buses were used exclusively in Coimbatore and not in Erode or Ooty and thus TNSTC CBE is not the para-statal here but merely a city-specific transport corporation. On the lines of the TNSTC-MTC mischief-making duo, the PRTC got itself a set of SLFs under JnNURM. PRTC hardly used any of them in its capital city. Instead, it chose to ply them between Pondicherry and Karaikal. One may argue that there is nothing wrong in this as they are two parts of Pondi only. They then ran them on East Coast Road [ECR] along with the TNSTC VPM Volvos. This, made them serial offenders, just like the others. A Volvo B7RLE bus owned by the Kerala State Road Transport Corporation at Angamally Bus Station, heading for Aroor. Image copyright RanjithSiji, CC-BY-SA 3.0 Unported, available on the Wikimedia Commons. Another arty and masterful violator, KeSRTC received Volvo B7RLEs for use in Kochi and Thiruvananthapuram. What did they do with these? Run them on intercity routes, of course. No SPV was created. The Central Government stepped in and objected to this violation, going so far as taking KeSRTC to court. However, being crafty, the KeSRTC found a work-around for this. The court order affected only buses belonging to the Kochi division, prompting KeSRTC to transfer most of these buses to the Thrivananthapuram division. The reason? These buses were super-profitable and KeSRTC otherwise had only one Volvo service between Trivandrum and Bangalore, which was running at a loss due to KaSRTCs super-efficiency. In November 2014, KeSRTC finally created an SPV called the Kerala Urban Road Transport Corporation [KURTC] exclusively for JnNURM buses, thus making it an SPV for a cluster of cities. A low-floor Tata Marcopolo Bus belonging to the Karnataka State Road Transport Corporation -Mysore City Transport Department. Image copyright Srikanth Ramakrishnan, CC-BY-SA 3.0, Unported, available on the Wikimedia Commons. Mysore received a batch of Volvo and non-AC buses under the JnNURM. These buses were operated by the Mysore City Transport Department [MCTD] of the KaSRTC. The MCTD had existed long before launch of JnNURM. In 2010, in order to comply with JnNURM norms, the state government decided to initiate the process of turning the MCTD into the Mysore City Transport Corporation [MCTC] as a body to not only operate buses [JnNURM and otherwise], but also for ease of implementing a World Bank-funded Intelligent Transport System [ITS] in the city. Of course, this was shelved when the government changed in 2013. Funding later on came for other cities including Hubli-Dharwad, Mangalore, Belgaum, Tumkur, etc, but no SPV was set up. Buses in the city of Hubli-Dharwad were operated by the North-West Karnataka Road Transport Corporation [NWKRTC]. In early 2014, the government set up a new entity, the North West Urban Transport Corporation [NWURTC], to operate JnNURM buses in the Hubli-Dharwad region. In 2012, the Government of Karnataka, NWKRTC, Hubli-Dharwad Municipal Corporation [HDMC], Hubli-Dharwad Urban Development Authority set up a company, the Hubli-Dharwad BRTS Company as an SPV that would oversee the construction, upgradation of the old Hubli-Dharwad Highway thru the twin cities, commissioning of the BRTS and its operations. KaSRTC has lived up by trying to follow norms as much as possible. One just hopes that Mysore and Mangalore get their own transport corporations soon. A Volvo B7RLE operating under the brand name of Metro Luxury by the Andhra Pradesh State Road Transport Corporation in Visakhapatnam. Image copyright LOVEofZ, CC-BY-SA 4.0 International, available on the Wikimedia Commons. The APSRTC, during the United Andhra days operated JnNURM buses in Hyderabad, and Visakhapatnam. It continues to operate the latter, while its younger sibling the TSRTC has taken over the erstwhile capital. There is no SPV to handle city operations. One hopes that the upcoming capital of Amaravati will have its own Transco, with funding under AMRUT. Along with this, several of the Volvo “Metro Luxury” buses have found their way to intercity routes, both in AP and Telangana. Note: Thanks to GSR Chaitanya for pointing out that APSRTC/TSRTC did indeed have an SPV. An article on this was posted a year earlier on Love of Z, a blog dedicated to APSRTC/TSRTC buses. You can read the article here. Buses in Hyderabad, on paper operate under the aegis of the Hyderabad Zonal Urban Road Transport Corporation. A Haryana Roadways JnNURM Ashok Leyland Bus. Image copyright Srikanth Ramakrishnan, CC-BY-SA 4.0, International, available on the Wikimedia Commons. Another serial offender, Haryana Roadways has both non-AC buses like the above, as well as Volvo B7RLEs, both of which, were allotted to the Faridabad division. Once again, there is no SPV here, and these buses always operate on the Gurgaon-Faridabad-Ballabgarh route. Buses that operate within Gurgaon, however, are non JnNURM buses. A Bharat Stage IV Volvo operated by the Bangalore Metropolitan Transport Corporation. Image copyright Hayathkhan.h, CC-BY-SA 3.0 Unported, available on the Wikimedia Commons. The BMTC, one of the largest beneficiaries under JnNURM, is a mere crook among the no-goodniks of the Transport world. It’s only violation of the JnNURM guidelines? Renting out buses. A large chunk of BMTCs revenue comes from leasing out its Volvo fleet to the IT sector for dedicated pickup and drop trips. The BMTC quickly rectified this however by purchasing brand new Volvo buses and deputing the JnNURM ones for Public Transport. A good move to conform to norms, but the downside? The IT sector gets the really good buses, the rest of us, nothing. A JnNURM double-door second generation Cerita owned by BEST, leased out to Air India for ferrying passengers between the aircraft and the terminal. Image copyright Prateek Karandikar, CC-BY-SA 4.0 International, available on the Wikimedia Commons. Another small-time crook in the world of the Mafioso, BESTs only mistake in violating JnNURM guidelines was leasing out its Second-Generation Cerita [yep, them Purple Faeries] to Air India to ferry passengers between the aircraft and the terminal. The cash-strapped body, with annual losses of ~₹700crore needed to monetise its fleet, and did so by leasing them out. However, word has it that the after the Air India agreement ended, BEST has been leasing out its older, First-Generation, Single-Door Cerita buses which were not acquired under JnNURM. In order to further monetise them, BEST put out full body adverts on them, thus turning them into giant, moving billboards. Now that we’re done with the villainous lot, let’s head to the heroes of the hour! This SPV was set up by the Rajasthan State Road Transport Corporation in 2008 to handle city buses in Jaipur. It operates JnNURM buses, other buses as well as the Jaipur BRTS. A bus operated by Atal Indore City Transport Services Ltd in Indore. Image copyright Prateek Karandikar, CC-BY-SA 4.0 International, available on the Wikimedia Commons. Set up to run bus services in Madhya Pradesh’s largest city, Indore, the AiCTSL, operates city buses, as well as the BRTS. It also operates a Radio Cab service in the city. For a further reading on JnNURM funding of buses, please read this. JnNURM has been scrapped in favour of the Atal Mission for Rejuvenation and Urban Transformation [AMRUT]. While nothing concrete has been set for buses, one hopes that AMRUT paves the way for more intelligent transit in the country.